The downtown Sheraton Fort Worth Hotel and Spa is ideally situated across the street from the Fort Worth Convention Center and within walking distance of the Fort Worth Sundance Square, Billy Bob's, the Fort Worth Cultural District, and more. Whether you choose to explore the historic Stockyards or spend the day in the Arts District, Fort Worth has it all. The Sheraton offers 22,000 square feet of flexible meeting space. Take advantage of our downtown location and beautiful facilities. Learn more about having your Fort Worth wedding reception or corporate meeting at the Sheraton Hotel. 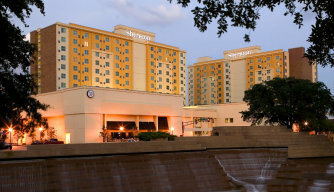 The Sheraton Fort Worth Hotel and Spa lets you explore a new destination. Experience the culture of downtown Fort Worth, dine at Shula's 347 Grill and surround yourself with football legend memorabilia, or reconnect at the unique and stylish Spa BEAUBELLE all without leaving the hotel.